Blue cheese: you either hate it or you love it. A lot of people find it hard to handle the overwhelming aroma and taste of this variety, but chucking it into a simple pasta dish is a great way to appreciate its intricacies without having your palate overpowered. Throw in one or two subtle ingredients and you’ll get a hearty meal that is as varied and nuanced as it is economical. 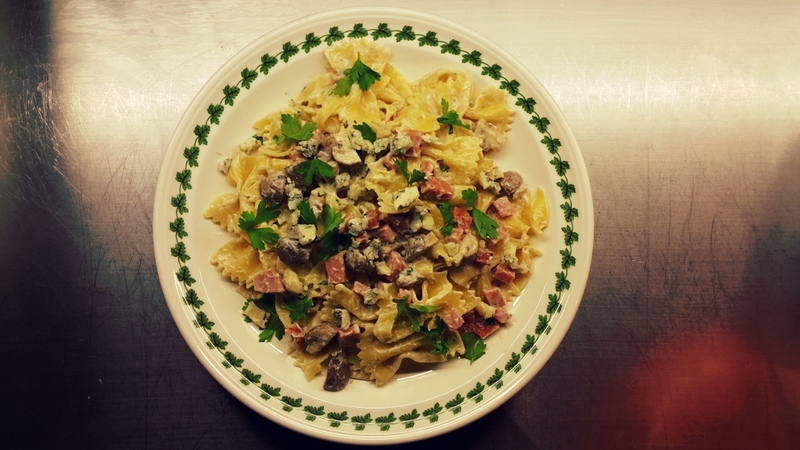 Like most pasta dishes, this gorgonzola farfalle is ridiculously quick and easy to make. Here’s what you need to do! Disclaimer: you don’t actually need that much ham. First up, get a pot of salted water to a rolling boil and add the dry farfalle, which should take roughly 10 minutes to become al dente. 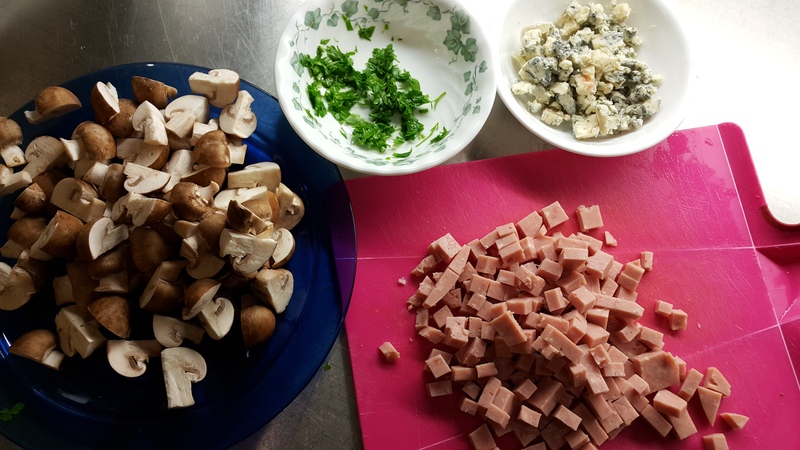 While that’s happening, chop up your mushrooms, gorgonzola, parsely and cooked ham, ready to add to the mix. All sliced up and ready to go. With the pasta still on the boil, set up another pot to make the sauce. For a standard 500g batch of pasta, all you really need is approximately a cup of plain sour cream. Having grown up using sour cream exclusively for dipping nachos into, I was astounded to learn how easy it is to convert this solitary ingredient into a delicious pasta sauce. Start by adding just the cream and mushrooms to the pot and season with a bit of salt and pepper. Don’t let it boil; just keep it simmering away slowly while you stir it occasionally. 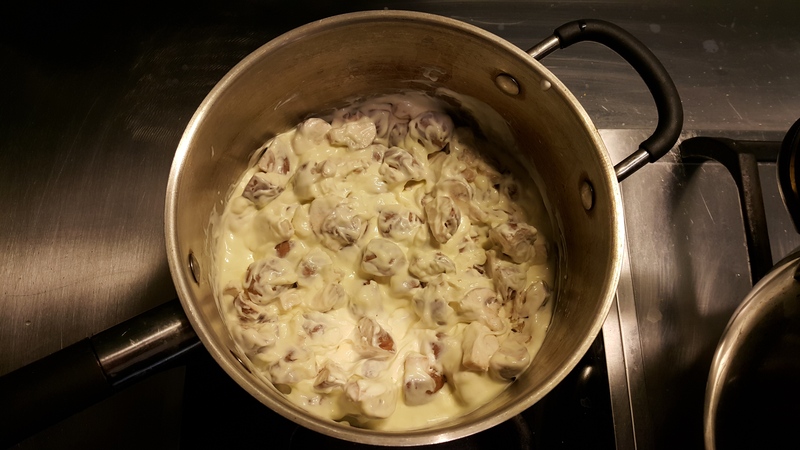 After about 10 minutes, the cream should have thickened somewhat, and this is when you stir in and melt that beautiful gorgonzola into the sauce. Add in the ham and parsley, stir it around a bit more and then finally add the pasta. Transfer onto some plates and garnish with some whole parsely leaves to finish it off. A pretty plain and simple pasta dish overall, but there’s certainly more than meets the eye. 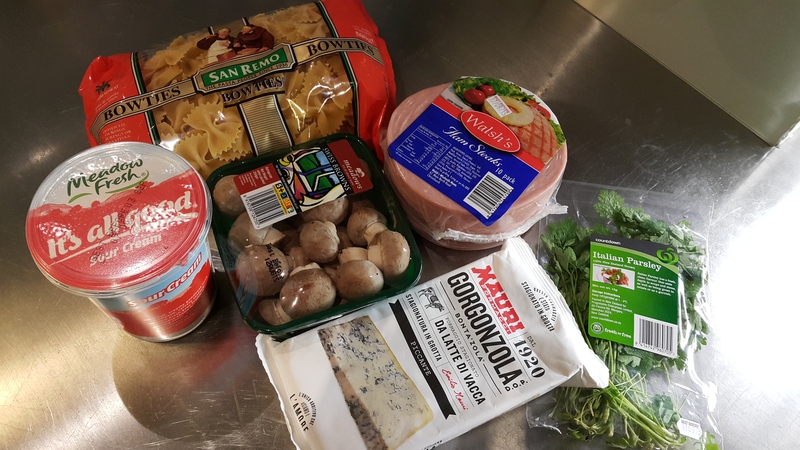 Gorgonzola is the perfect cheese for this and is what really makes it tick, with its pungent power nicely complemented by the softer tastes of the ham and mushroom. Cook up a large batch with a whole bag of pasta and either feed the whole family for a meal, or yourself for half a week. Don’t worry if the cream sauce still looks a bit runny after simmering it for 10 minutes – it will continue to cook when you add in the cheese, other ingredients and pasta. Crumble a large pinch of leftover gorgonzola over the pasta just before serving for the perfect finishing touch.